Jefferson Park, named for the avenue which runs through the middle of the neighborhood, begins just south of UVA’s main campus and spans west beneath Scott Stadium to Fontaine Research Park. 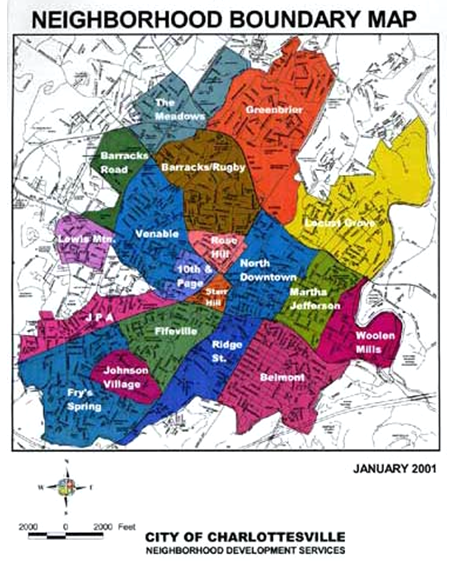 The reasonable rental options and proximity to UVA’s main campus attract many students and professors to the neighborhood. Jefferson Park has seen solid home value growth in recent years, with a compound annual growth rate of 2.77% from the beginning of 2013 to 2017, and new developments may push prices even higher. The average single family long-term rental is priced at $1,641 a month, giving Jefferson Park an average Price-to-Rent Ratio of 10.9, one of the lowest in Charlottesville. Jefferson Park boasts reasonable home prices and a good location. With UVA Hospital on the eastern side of Jefferson Park, and the Corner and main campus a short walk away, it provides great options for short and medium term renters. The proximity to UVA’s stadiums makes Jefferson Park a perfect fit for individuals coming into town for a football or basketball game. Nightly rental rates are extremely reasonable, rarely rising above $200, though options are limited. If you are looking for help in listing and marketing your home, contact us at Guesthouses!